For other uses, see Walking with Dinosaurs (disambiguation). Walking with Dinosaurs is a six-part documentary television miniseries created by Tim Haines and produced by BBC Natural History Unit. The series first aired on the BBC in the United Kingdom in 1999 with narration by Kenneth Branagh. The series was subsequently aired in North America on the Discovery Channel in 2000, with Avery Brooks replacing Branagh. The programme explores ancient life of the Mesozoic Era, portraying dinosaurs and their contemporaries in the style of a traditional nature documentary. Developed by Haines and producer Jasper James, Walking with Dinosaurs recreated extinct species through the combined use of computer-generated imagery and animatronics that were incorporated with live action footage shot at various locations. The Guinness Book of World Records reported that the series was the most expensive documentary series per minute ever produced. A re-edited version of Walking with Dinosaurs aired on Discovery Kids for the first season of Prehistoric Planet. It was made more appropriate for children by removing most of the graphic content and trimming down some footage to fit the run time. The series received critical acclaim, winning two BAFTA Awards, three Emmy Awards and a Peabody Award in 2000. Walking with Dinosaurs began a franchise that was followed by two additional miniseries, several television specials, spin-offs, a live-theatrical show, and a feature film of the same name. Conguillío National Park in Chile (top) and the Isle of Pines in New Caledonia (bottom) served as filming locations. Creator Tim Haines contemplated the idea of a dinosaur-centric documentary in 1996, spurred by the resurgence of public interest in prehistoric life following the release of Jurassic Park (1993). Together, with producer Jasper James and effects specialist Mike Milne, Haines shot a six-minute pilot in Cyprus as a proof-of-concept to BBC Worldwide and Discovery Channel for financing. Principal photography took place at a variety of global locations, including Conguillío National Park in Chile, the Redwood National and State Parks in California, New Caledonia, New Zealand, Tasmania, and the Bahamas. Filming consisted of wide landscape shots devoid of any live-action creatures and close-up shots with animatronics. The only creatures in the pilot that are not shown in the series are Cetiosaurus and Scaphognathus. 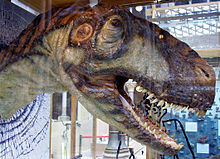 Since an extensive amount of computer-generated imagery would be necessary in creating the numerous full-size dinosaurs that the project demanded, Haines initially approached Industrial Light & Magic (ILM), the company responsible for creating the visual effects in Jurassic Park. ILM projected a cost of $10,000 per every second of footage featuring a CGI shot, an estimate which BBC deemed too expensive for a television budget. Instead, Haines contracted Framestore, a local British visual effects company to create the CGI elements. Maquettes were built and then scanned, with the resulting 3D models animated in Softimage 3D and added to the live-action backgrounds. Framestore consulted several palaeontologists in assisting them with developing natural movements and appearances for the dinosaurs. Michael Benton, Thomas R. Holtz, Jr., Peter Dodson, Peter Larson, Dave Martill, and James Farlow, served as consultants; their influence in the filming process was documented in the companion piece, The Making of Walking with Dinosaurs. The CG work was created over the course of two years. Michael J. Benton, a consultant to the making of the series and professor of vertebrate palaeontology at the University of Bristol, notes that a group of critics gleefully pointed out that birds and crocodiles, the closest living relatives of the dinosaurs, do not urinate; they shed waste chemicals as more solid uric acid. In the first episode of Walking with Dinosaurs, a male Postosuchus urinates copiously to mark a female's territory as his own after she is driven away from it. However, Benton notes that nobody can prove this was a real mistake: copious urination is the primitive state for tetrapods (seen in fish, amphibians, turtles, and mammals), and perhaps basal archosaurs did the same. He believes many other claims of "errors" identified in the first weeks fizzled out, as the critics had found points about which they disagreed, but they could not prove that their views were correct. Ornitholestes, a theropod dinosaur of the Late Jurassic, is shown with a small crest atop its head. However, subsequent studies have concluded that it most likely did not have such a crest, and that the misconception that it did came as a result of broken nasal bones in the holotype. Tropeognathus is depicted as far larger than it actually was. In the book based on the series, it was claimed that several large bone fragments from the Romualdo Formation of Brazil possibly indicate that Tropeognathus may have had a wingspan reaching almost 12 metres and a weight of a hundred kilograms, making it one of the largest known pterosaurs. However, these specimens have not been formally described. The largest definite Tropeognathus specimens known measure 6 metres in wingspan. The specimens which the producers of the program used to justify such a large size estimate are currently undescribed, and are being studied by Dave Martill and David Unwin. Unwin stated that he does not believe this highest estimate is likely, and that the producers likely chose the highest possible estimate because it was more "spectacular." However, no other Early Cretaceous pterosaurs reached its size. Similarly, Liopleurodon is depicted as being 25 m (82 ft) long in the series, whereas the adult size known to have been reached by Liopleurodon is around 7 m (23 ft). This was also based on very fragmentary remains of which the 20 metre measurement given have been considered dubious, and it is unlikely that these remains belong to Liopleurodon. BBC One aired the series weekly on Monday nights, with a regular repeats the following Sunday. In 2010, the series was repeated on BBC Three in omnibus format, as three hour-long episodes. By a river, a female Coelophysis stalks a herd of dicynodonts called Placerias, looking for weak members to prey upon. Downstream, a male Thrinaxodon resides in a burrow with his family. A female Postosuchus, a rauisuchian and one of the largest carnivores alive in the Triassic, attacks the Placerias herd, and wounds one individual; the herd scatters, leaving the wounded Placerias to the Postosuchus. Early pterosaurs called Peteinosaurus are depicted feeding on dragonflies and cooling themselves in the little water remaining during the drought. Still searching for food, the Coelophysis discover the Thrinaxodon burrow; the male wards them off. Later that evening, after he goes off hunting, an inquisitive pup follows the male to the entrance and is eaten by the female Coelophysis. At night, the Thrinaxodon pair eat their remaining young and then move away. On the next day, the Coelophysis work to expose the nest. The female Postosuchus is later shown to have been wounded by the Placerias, a prior attack on them leaving her with a tusk wound on her thigh. After being unable to successfully hunt another Placerias, she is expelled from her territory by a rival male. Wounded, sick, and without a territory, the female dies and is eaten by a pack of Coelophysis. As the dry season continues, food becomes scarce. The Placerias herd embarks on a journey in search of water, while the Coelophysis begin to cannibalise their young, and the male Thrinaxodon also resorts to hunting baby Coelophysis at night. Finally, the wet season arrives; the majority of the Coelophysis have survived (including the lead female), and the Thrinaxodon pair have a new clutch of eggs. The episode ends with the arrival of a migrating herd of Plateosaurus, foreshadowing the dominance of the sauropods after the Triassic-Jurassic extinction event. In the credits it is explained that 20 million years later, the aforementioned extinction wiped out many reptile species, but the dinosaurs continued to evolve, with carnivores growing to massive sizes and their prey becoming even larger, setting the stage for the giants of the Jurassic. This episode follows the life of a female Diplodocus, beginning at the moment when her mother lays a clutch of eggs at the edge of a conifer forest. Months later, some of the eggs hatch; the young sauropods are preyed upon by Ornitholestes. After hatching, the hatchlings retreat to the safety of the denser trees. They face many dangers as they grow, including predation by Ornitholestes and Allosaurus. While fending off a pair of Allosaurus, a Stegosaurus also accidentally kills one of the hatchlings while swinging its tail. Elsewhere, adult herds of Diplodocus are shown using their massive weight to topple trees in order to reach cycad leaves. Each Diplodocus hosts a small mobile habitat of damselflies, Anurognathus, and dung beetles. After some time, the creche of Diplodocus have grown into subadults. Nearly all are killed by a huge forest fire; only three survivors emerge onto the open plains, including the young female. They encounter several Brachiosaurus before two reach safety to a herd of adult Diplodocus. Several years later, the female mates, and is attacked by a bull Allosaurus. She is saved when another Diplodocus strikes the Allosaurus with its tail. Although she is wounded, she rejoins the herd. The closing narration notes that the sauropods will only get larger, becoming the largest animals ever to exist. In the credits it is stated that the sauropods eventually went into decline with their prairies becoming flooded by rising sea levels, resulting in vast inland seas and the giant marine reptiles that patrolled them. The episode begins with a Eustreptospondylus being snatched from the shore by Liopleurodon. Meanwhile, hundreds of Ophthalmosaurus arrive from the open ocean to give birth. Hybodus and a Liopleurodon are on the hunt; when a mother Ophthalmosaurus has trouble giving birth, a pair of Hybodus pursue her. They are frightened off by a male Liopleurodon, which eats the front half of the ichthyosaur. Meanwhile, a Eustreptospondylus swims to an island and discovers a turtle carcass; it fights over the carcass with another Eustreptospondylus. Later, during the night, a group of horseshoe crabs gather at the shore to lay their eggs, which attracts a flock of Rhamphorhynchus in the morning to eat the eggs. However, a few of the pterosaurs are caught and eaten by a Eustreptospondylus. While the Ophthalmosaurus juveniles are growing up, they are hunted by Hybodus, which in turn, are prey for the Liopleurodon. While the male Liopleurodon is hunting, he encounters a female Liopleurodon; after the male bites one of her flippers, she retreats from his territory, and a group of Hybodus follows the trail of her blood. A cyclone strikes the islands, killing many animals, including several Rhamphorhynchus and the Liopleurodon, who is washed ashore and eventually suffocates under his own weight. A group of Eustreptospondylus feed on his carcass. At the end of the episode, the juvenile Ophthalmosaurus that survived the storm are now large enough to swim off and live in the open sea. In the credits, it is stated that even though only turtles remain, marine reptiles were a glory of their age and that another group shared the dinosaur's world, the flying pterosaurs, which are claimed to be just as spectacular. The episode begins with a male Tropeognathus dead on a beach. Six months earlier, the Tropeognathus, resting among a colony of breeding Tupandactylus in Brazil, flies off for Cantabria where it too must mate. He flies past a migrating group of the iguanodont Dakotadon and the nodosaur Polacanthus. He reaches the southern tip of North America, where he is forced to shelter from a storm. He grooms himself, expelling his body of Saurophthirus fleas; the crest on his jaw begins to change colour in preparation for the mating season. He then sets off across the Atlantic, which was then only 300 kilometres wide, and after a whole day on the wing, reaches the westernmost of the European islands. He does not rest there however, as a pack of Utahraptor are hunting Iguanodon; a young Utahraptor is bullied off an Iguanodon carcass by the adults. The Tropeognathus flies to the outskirts of a forest to rest after stealing a fish from another pterosaur, but is driven away by Iberomesornis. Flying on, he reaches Cantabria, but due to the delays, exhaustion, and old age he cannot reach the centre of the many grounded male Tropeognathus and consequently he does not mate. After several days under the sun trying to attract a mate, the protagonist Tropeognathus -alongside others who lost out- dies from heat exhaustion and starvation. The next generation of Tropeognathus feeds on their corpses. In the credits, it is stated that the pterosaurs continued to rule the skies for millions of years while the dinosaurs continued to spread across the globe, even in the most extraordinary environments, such as the South Pole. A few hundred kilometres from the South Pole, a clan of Leaellynasaura emerge during spring after several months of total darkness. They feed on the fresh plant growth, and build nests to lay their eggs; a male Koolasuchus also wakes and heads to a river, where he will stay during the summer. Out on the banks of the river, migrating herds of Muttaburrasaurus have also arrived to feed and lay their eggs. When summer arrives, many of the Leaellynasaura clan's eggs have been eaten; however, those of the matriarch hatch successfully. Meanwhile, a male Australovenator (6m) hunts both the Leaellynasaura and the Muttaburrasaurus, the latter species also having to deal with blood-sucking insects. When autumn arrives, the Muttaburrasaurus herd begins to migrate, and the Koolasuchus leaves the river to find a pool for hibernation. During the migration, some Muttaburrasaurus become lost in the forest; they vocalize loudly while trying to return to their herd, preventing the Leaellynasaura clan's sentries from hearing the Australovenator approaching. It manages to kill the matriarch of the clan. Winter descends and the forest is shrouded in darkness, but the now matriarch-less Leaellynasaura clan is able to stay active, using their large eyes to help them forage for food. The clan and other creatures are also shown to use various methods of coping with the cold such as being frozen alive or suspended animation. Finally, spring returns, and two Leaellynasaura males challenge each other for the right to mate, and the clan establishes a new dominant pair. The closing narration states that continental drift will soon pull this landmass closer to the South Pole, and this unique ecosystem will soon disappear. In the credits, it is explained that away from the poles, the dinosaurs continued to rule the Earth for another 40 million years before extinction and hints that just before the end of their reign, they had evolved their most infamous predator ever. Several months before the Cretaceous-Paleogene extinction, the last dinosaurs are living under intense environmental stress due to excessive volcanism. A female Tyrannosaurus abandons her nest, the eggs rendered infertile due to poisonous volcanic gases. Her calls for a mate are answered by a smaller male, who kills a young Triceratops to appease her. Three days later, after repeated copulation, she drives him off. The mother fasts as she tends to her nest, contending with raids by Dromaeosaurus and Didelphodon. Meanwhile, herds of Edmontosaurus wander between islands of vegetation among the volcanic ash, and Torosaurus rut for the right to mate, while losing their young to attacking Dromaeosaurus. Only three of the Tyrannosaurus eggs hatch; the mother hunts an Edmontosaurus to feed herself and her brood. Several days later, while defending her two surviving offspring, the mother is fatally injured by the tail of an Ankylosaurus. The juveniles remain expectantly next to the carcass of their mother the next morning; several hours later, they are killed along with the other dinosaurs in the region by the impact of an asteroid. In an epilogue, the present-day African plains are shown; while they are now dominated by mammals after the extinction, they are still populated by numerous surviving dinosaurs: the birds. 50-minute special documenting the series' paleontological influence, animatronic effects, CGI and the real location shooting for the series background. Ben Bartlett composed the score for Walking with Dinosaurs. Bartlett was encouraged to accept the duties of composing the series' music at the behest of Haines and James. Bartlett wrote different leitmotifs in separate styles for each episode, citing the different themes and settings presented in each episode as inspiration, elaborating, "I tried to create a different sound world for each episode of Walking With Dinosaurs. That was easy, as they all had different moods. The first episode is all about heat and bloodlust, parched deserts and so on, while the second one was pastoral, peaceful, and beautiful, about dinosaurs living in symbiosis with the forests. And so on." The recording process took place at Angel Recording Studios in Islington, with four sessions scattered over the early months of 1999. The score was recorded by the BBC Concert Orchestra. During these sessions, Bartlett admitted to being enriched with experience by the task, stating, "It was the biggest orchestral endeavour I've ever undertaken, and I learnt so much from the first session. Practical things, like handing out the parts to the players before the session, numbering pages... tiny logistical things that can really screw up a session." 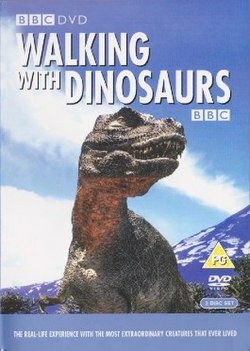 Ben Bartlett's original score for Walking with Dinosaurs was released by BBC Music on CD on 11 April 2000. All music composed by Ben Bartlett. Walking with Dinosaurs received critical acclaim following its initial broadcast. The series won two BAFTAs for Innovation and Best Original Television Music and earned six Primetime Emmy Award nominations, winning for Outstanding Animated Program, Outstanding Special Visual Effects and Outstanding Achievement in Non-Fiction Programming – Sound Editing. In a list of the 100 Greatest British Television Programmes drawn up by the British Film Institute in 1999, voted on by industry professionals, Walking with Dinosaurs was placed 72nd. Common Sense Media praised the program, giving it five stars out of five and saying that, "Somebody had a great idea, which was to make a documentary series about dinosaurs, but with a twist. The ageing Tropeognathus on a desperate final flight to his mating grounds, the sauropod hatchlings struggling for survival in the late Jurassic, the migrating herds and the undersea life of 150 million years ago would all seem as real as a nature program about polar bears or snow monkeys." This technique of narrating the prehistoric life as though it were current has been used several times since, for example in the BBC's 2011 Planet Dinosaur series. A companion book was written by Tim Haines to accompany the first screening of the series in 1999. The settings of some of the six episodes were changed between the time the book was written and the screening of the television series, and some of their names were changed: "New Blood" is set at Ghost Ranch, and "Cruel Sea" is set at or near Solnhofen in Germany near what then were the Vindelicisch Islands. The book elaborated on the background for each story, went further in explaining the science on which much of the program is based, and included descriptions of several animals not identified or featured in the series. A companion volume to the first book "Walking with Dinosaurs: The Evidence" by David Martill and Darren Nash was published in 2000. It went into more detail about the research and suppositions that went into making the series. Walking with Dinosaurs: The Arena Spectacular is a live theatrical show adaptation and travelling exhibition of the series that originated in Australia in January 2007 (as Walking with Dinosaurs: The Live Experience), and toured North America in 2007–10, Europe in 2010, and returned to North America until 2011. It also toured Asia beginning in December 2010. In 2011 the show came to its final destination of its first tour, New Zealand. In 2012, the show toured the UK, Germany, Ireland, Norway, Sweden, Denmark, Finland, and the Netherlands. For 2018, the show again toured various European cities. Released in 2013, Walking with Dinosaurs is a feature-length film about dinosaurs in the Late Cretaceous period 70 million years ago. The production features computer-animated dinosaurs in live-action settings with actors John Leguizamo, Justin Long, Tiya Sircar, and Skyler Stone providing voiceovers for the main characters. It was directed by Neil Nightingale and Barry Cook from a screenplay by John Collee. The film was produced by BBC Earth and Evergreen Films and was named after the original BBC miniseries. The film, with a budget of US$80 million, was one of the largest independent productions to date; it was financed by Reliance Entertainment and IM Global, with 20th Century Fox handling distribution. The crew filmed footage on location in the U.S. state of Alaska and in New Zealand, which were chosen for their similarities to the dinosaurs' surroundings millions of years ago, and on locations in Humboldt County, California. Animal Logic designed computer-animated dinosaurs and added them to the live-action backdrop. Though the film was originally going to have a narrator like in the miniseries, Fox executives wanted to add voiceovers to connect audiences to the characters. Walking with Dinosaurs premiered on 14 December 2013 at the Dubai International Film Festival. It was released in cinemas in 2D and 3D on 20 December 2013. Critics commended the film's visual effects but found its storytelling to be sub-par and derided the voiceovers as juvenile. The film grossed US$34.4 million in the United States and Canada and US$71.6 million in other territories for a worldwide total of US$106 million. The Hollywood Reporter said the film's global box office performance was disappointing in context of the production budget and marketing spend. ^ 7 day data, including the original Monday broadcast and Sunday repeat for all six episodes. ^ "Walking with Dinosaurs The Origins". Archived from the original on 23 April 2013. Retrieved 28 May 2012. ^ a b McClintock, Pamela (January 15, 2014). "T-Wreck: Why Fox's 'Walking With Dinosaurs' Went Extinct". The Hollywood Reporter. Retrieved April 10, 2016. ^ "Most expensive television documentary series per minute". Guinness World Records. 14 June 2015. ^ McClintock, Pamela (2 August 2011). "Fox Sets 'Walking With Dinosaurs' for Christmas 2013 Release". The Hollywood Reporter. Retrieved 13 August 2011. ^ a b c Bell, Matt (February 2000). "Ben Bartlett: Music For Walking With Dinosaurs". Sound on Sound. SOS Publications Group. Retrieved April 10, 2016. ^ Haines, Tim. "The Making of…Walking with Dinosaurs". Retrieved 10 April 2016. ^ Huelsman, Eric (1 March 2000). "Walking With Dinosaurs". Animation World Network. Retrieved April 11, 2016. ^ "birds and crocodiles, the closest living relatives of the dinosaurs, do not urinate". Benton, M. J. 2001. "The science of 'Walking with Dinosaurs'". Teaching Earth Sciences, 24, 371–400. ^ Ornitholestes Prehistoric Wildlife. Web. Retrieved 12 February 2016. ^ Smith, Adam. "Liopleurodon". The Plesiosaur Directory. Retrieved 11 March 2012. ^ Walking With Dinosaurs - Compilations - Episode 1 bbc.co.uk Retrieved 19 September 2018. ^ New Blood: Walking with Dinosaurs, Original series Episode 1 of 6 bbc.co.uk. Web. Retrieved 13 February 2016. ^ https://www.barb.co.uk/viewing-data/weekly-top-30/ Weekly top 30 programmes BARB Web. Retrieved 19 September 2018. ^ "Time of the Titans - Walking with Dinosaurs, Original series Episode 2 of 6". ^ "Cruel Sea - Walking with Dinosaurs, Original series Episode 3 of 6". bbc.co.uk. ^ "Giant of the Skies - Walking with Dinosaurs, Original series Episode 4 of 6". bbc.co.uk. ^ "Spirits of the Ice Forest - Walking with Dinosaurs, Original series Episode 5 of 6". bbc.co.uk. ^ "Death of a Dynasty - Walking with Dinosaurs, Original series Episode 6 of 6". bbc.co.uk. ^ "The Making of Walking With Dinosaurs - BBC One". bbc.co.uk. ^ Wilson, MacKenzie. "Walking with Dinosaurs: Original TV Soundtrack". AllMusic. All Media Network. Retrieved 11 April 2016. ^ "Walking with Dinosaurs review". Commonsensemedia.com. Retrieved 24 March 2011. ^ Martill, Dave; Naish, Darren (2000). Walking with Dinosaurs: The Evidence. London: BBC Books. ISBN 0-563-53743-4. ^ Amar Singh. "T-Rex comes to town". The Mail Online. Retrieved 28 May 2012. ^ Pomerantz, Dorothy (November 8, 2013). "'Walking With Dinosaurs' Is A T-Rex Sized Independent Film". Forbes. Retrieved April 10, 2016. ^ Hesseltine, Cassandra. "Complete Filmography of Humboldt County". Humboldt Del Norte Film Commission. Humboldt Del Norte Film Commission. Retrieved 12 October 2017. "Walking With Dinosaurs: The Origins". Archived from the original on 23 April 2013. Retrieved 28 May 2012.